Welcome back to the third, and final, installment on stop-motion animation. When planning a stop motion animation project with students teachers need to be aware of the tools necessary, the steps for creating a project like this, some tips for success, and additional resources to ensure students learn, have fun, and create quality products. Determine Frames Per Second (# of images needed to make a second = # of images needed to make the full length feature) Frames Per Second for video are normally 30 but programs can let you adjust that) – let your students do the calculations when planning their projects. Plan carefully – Make a storyboard before you animate. Small movements – A little goes a long way; use the onion-skinning option to see where the last frame was placed. Assign roles – Modellers, clickers, spotters, movers; each student can be responsible for a task. 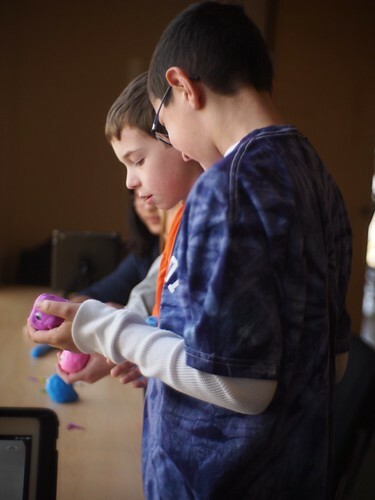 Leave a comment…..We’d love your thoughts and ideas about stop motion animation as authentic products in the classroom. Share links to your student’s stop-motion projects. Tell us about all of your experiences using stop motion animation including implementation ideas, tips, additional resources, etc. Brooke Higgins is an instructional specialists for the eMINTS National Center and Allison Byford is the Instructional Technology Coordinator with the Springdale Public Schools in Arkansas and is an eMINTS PD4ETS graduate. Recently, Allison Byford shared the basic tools and steps for helping students to create stop motion animation movies in her post Stop Motion Animation Made Easy – Part 1 . Today we’ll take that a step further and share more examples, tools needed, step-by-step how to instructions, and some tips for a successful implementation. Many of you have seen the OK GO video for their song “Here it Goes”, but have you seen the LEGO “Here it Goes”. It’s an example of how a student with a creative mind and a camera recreated the video. If you are an eMINTS teacher you have surely seen some of the great Common Craft videos covering topics such as “GoogleDocs in Plain English” or “Electing a US President in Plain English”. While common craft videos aren’t purely stop motion they include some content recorded in stop motion animation as well as video. 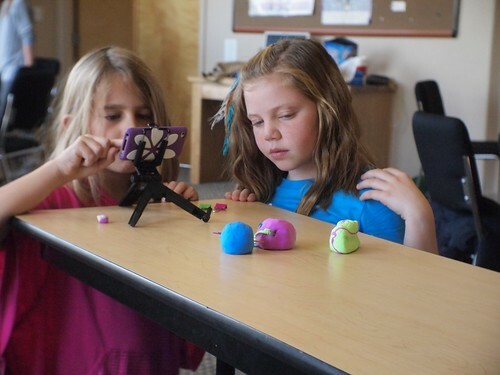 When thinking about how stop motion animation could be connected to curriculum teachers can use stop motion video to present new concepts, record what happens during an extended Science experiment, or to present learned content. Stop motion animation can be used in creative writing lessons to tell story with or without words or retell stories. Students can present their understandings of math concepts by creating videos that may be used to teach newly learned skills to others. Students can represent historical concepts, create documentaries, or reenact historical events to show their understanding of the impact of history. Not only can curriculum content be covered but students can also focus in on using 21st Century Skills when creating stop motion animation projects. These kinds of projects can require students to Think and Work Creatively with Others, Communicate Clearly, Collaborate with Others, Adapt to Change, Be Flexible, Manage Goals, Time, and Projects, Produce Results, Create Media Products, and Apply Technology Effectively. Tune in tomorrow to learn the steps for creating successful projects like these. Have you ever watched a movie like Wallace and Grommit or The Nightmare Before Christmas or even films like Toy Story or Up and wished that you were good enough to do that? Have you ever marveled in amazement in what it takes to animate and the frames and frames of footage that have to be created and put in place to produce even one minute of video. The intricacies of this kind of project have to be mind-boggling, right? Well, I’ve got good news! Animation and creating animated projects is easier that one might think. In fact, not only is it easy to do for one person….but better yet, it’s even easier if you use a team approach with interdependent roles! In fact, it is proving to be, in our district, one of the most engaging ways for students to create a culminating project. They can create movies fast and they love it so much they can’t STOP!! Stop-motion animation is essentially collecting a series of photographs and rendering them together at a rate of anywhere from 8 frames a second to 30 frames a second. Thanks to some amazing web 2.0 tools, kids (even our youngest) can do this with ease. At the most basic level, for stop-motion animation projects to be created, you need a storyboard/script, camera, some props, and software that “sticks” all the photographs together. If you are using a PC, a good option is Jellycam. Jellycam has a quick and simple tutorial that will walk a learner through the specifics of the software in just a couple of minutes. It allows the user to easily capture and manipulate the pictures taken with a web cam within the program. Users determine how many images per second and can play back the video as it is being created. It also allows for adding credits and music within the software. JellyCam is a completely free download. 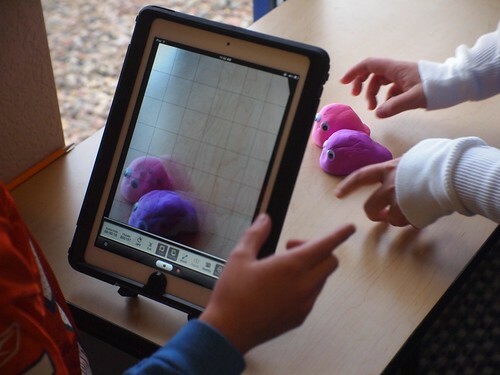 Creating a stop-motion animation project can also be easily created on an iPad2. One favorite App for doing this is StoMo. In this App, you capture images directly into your iPad using the capture button. You can set the rate of pictures being seen per second, arrange and re-arrange the images captured, playback projects as you work on them and use either the front or rear camera. When you export the project to the library, the images are rendered together and the “film” is put in the iPhotos library to be viewed. StoMo does not allow users to add music, voice over, or text to the film but once a project is finished it can be exported to iMovie, Moviemaker, or some other movie editing software to add music, voice over, or text. Both of these applications have a key feature that is critical for stop motion creators – onion skinning. If you think about the skin of an onion, it is somewhat transparent. In stop-motion animation it is critical to be able to see the last image taken and be able to compare it to the one about to be taken. Onion skinning allows for the creator to move objects in the films as much or little as desired. Another classroom benefit of onion skinning allows for students, who’s “filming” schedule is often interrupted by the bell, to come back the next day and pick up where left off. They can see the last image captured and begin from there on a new day. As a teacher, the best part of stop-motion animation projects is that the students REALLY need each other to complete a quality project quickly! In a group of four students each has a vital role. One person serves as the project manager, or director of the project. That person focuses on the vision and directs the project as it progresses. One person needs to focus completely on the software. That person knows exactly how the software works, captures images, and keeps the program running. The other two members of a group are moving manipulatives (characters and props) to create the animated sequences. It takes everyone in the group doing their parts to be successful. Check out some examples of student stop-motion animation projects below and start planning a project for your students. Stay tuned for the next Stop Motion Animation installment sharing more classroom examples, how-to’s, tips, and resources for classroom stop motion projects. Social Studies – Confederacy or Union? How might your students express what they have learned with a stop motion animation project in your classroom? Allison Byford is the Instructional Technology Coordinator with the Springdale Public Schools in Arkansas and is an eMINTS PD4ETS graduate.